Democrat Sally Hernandez was cruising toward easy victory in the race for Travis County sheriff. It's likely to put her in the crosshairs of the Texas Legislature, where top Republicans are promising to ban "sanctuary city" policies. Democrats were sweeping Travis County as usual, lifting Hernandez toward the post of top cop. She was crushing Republican Joe Martinez in a race that focused in large part on her vow to stop holding potentially deportable immigrants for federal authorities at the Travis County jail. Martinez conceded early Tuesday evening, saying he wanted to "make a difference" but came up short. "I jumped in this race knowing it was an uphill climb. You never know what you're going to find until you spend time, money and energy," he said. "If that's not what they want, it's on them, not me." The victory is likely to put Hernandez on a collision course with the Texas Legislature, where all the top Republicans are promising to ban the kind of policy changes she promised to pursue and that many of her supporters favor. Hernandez promised during the campaign to get U.S. Immigration and Customs Enforcement, or ICE, out of the county jail. More specifically, she said she would not hold inmates for ICE when the federal agency seeks to remove them from the country with so-called “detainer” requests. 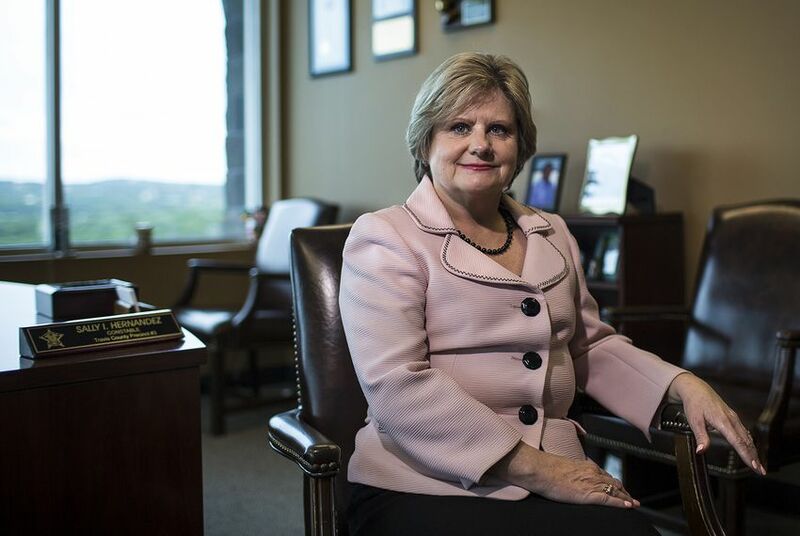 She reiterated that stance in an interview this summer with The Texas Tribune, when she said she would "no longer hold individuals in the Travis County jail who don’t have pending charges." That would include potentially deportable immigrants ICE wants the jail to hold for up to 48 hours until the agency can pick them up. But in more recent public statements, Hernandez has softened her stance, telling the Austin American-Statesman last month, "I'm not going to end working with Immigration." But she said her policy would be "very progressive." There is no standard definition for “sanctuary city,” but ICE tracks local law enforcement agencies that have policies limiting cooperation — the majority of which are in California. And top leaders, including Gov. Greg Abbott, have focused their ire on policies at the jail level while remaining largely silent about how law enforcement treats undocumented immigrants during patrols and investigations. Business interests with considerable clout in the Legislature — and which rely on immigrant labor — have expressed fierce opposition in the past to empowering police officers to inquire about citizenship status but have not openly opposed efforts to ensure criminally charged immigrants are held for ICE by county jailers. To date, no Texas County has adopted a policy of declining all ICE civil detainer requests at its jail as Hernandez proposed on the campaign trail, according to recent lists compiled by the federal agency.